If you like a bit of exercise before and after your curry then it’s time to board the Bangalore Express. The trendy Waterloo restaurant is a stylish mix of smaller tables and highly polished long tables that encourage communal eating a la Wagamama. 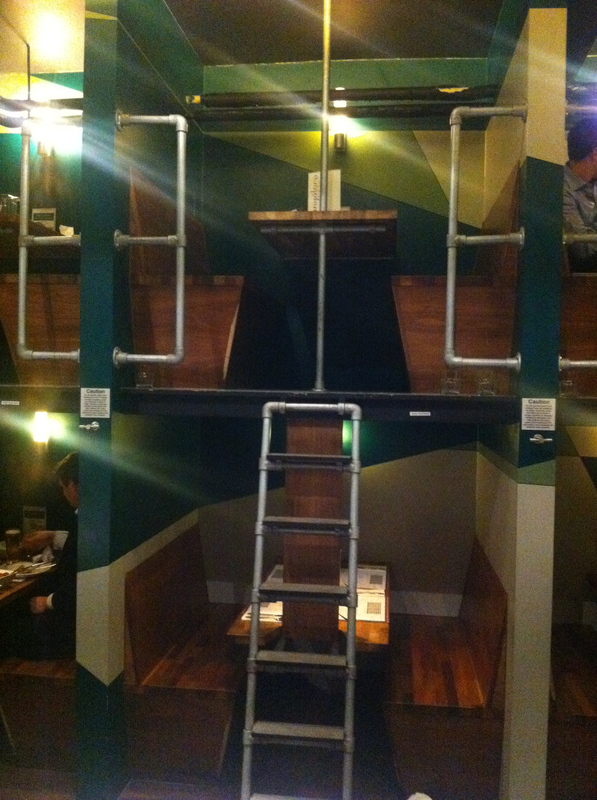 But the central design feature is the upstairs booths that are accessed via a bunk-bed style ladder, a quirky and fun part of the restaurant (although we were told they couldn’t be used as it was late, which seems a bit odd when it’s clearly used as one of the attractions of the place). The menu itself (printed in that casual throwaway sheet ‘we’re just soooo cool’ style) maintains the fun with some great world dishes on offer such as South Africa’s Bunny Chow (£10.50), Sri Lankan spicy mixed seafood with kottu roti bread (£10.50) and Burmese Chicken khauk-swe with thick egg noodles (£9.50) as well as old favourites like Chicken Tikka (£5.95) and Prawn Biryani (£11.50). Add 12.5% plate tax (sorry service charge) to all prices. But central to the menu is the mix-and-match grid of ‘Big plates of curry and rice’ (£11.50, add £1.50 for prawns). Step one, choose from duck, lamb, chicken, prawns, fish, mixed seafood or vegetables, then your cooking style (from mild korma to fiery hot jungle curry), add a vegetable side (Bombay potato salad maybe?) and complete with your favourite rice (plain, pilau, mushroom and so on). Sadly it seems to be a case of concept over curry because my choice of Kerala red rice, duck and medium tikka masala lacked cohesion. It’s clear, due to the concept, the meat was not cooked in the sauce, which is the very essence of what a curry is. Don’t get me wrong, the quality of the individual ingredients is great, but it just feels like the chefs are dishing out your options from pots out back. I suppose it is a mix-and-match menu after all. But, hey, there’s always the bunk style seats. Bangalore Express, 103-105 Waterloo Road, London, SE1 8UB. Tel: 020 7021 0886. e-mail: info@bangaloreexpress.co.uk. Open: daily 11.30am-midnight. Having spent a frantic twenty minutes during my lunch hour rushing down here to try the bunny chow listed on this restaurant’s menu, i can confirm that the dish i left carrying – without checking beforehand, unfortunately – is neither a bunny chow or even vaguely south african in its ingredients or its appearance. What this essentially represents is a large white breadroll with a form of curry (lamb, I believe) spread in the center, served in a plastic takeaway dish with the remaining curry around the roll. No traditional south african flavours or quarter breadloaf in sight whatsoever. Interesting for a fiver I suppose, but in no way south african at all.